The NCAA men’s hockey tournament is underway, and it’s the biggest time of the year in college hockey. The event gets lost in the shuffle of the other big March tournament in the NCAA men’s basketball championship. College hockey doesn’t grab the headlines like the other sports do in March because the races to the NHL and NBA playoffs as well as the impending start of the Major League Baseball season. However, here are five reasons to watch college hockey’s version of the big dance. The first round of the tourney has some good rivalry matchups. The opening-round game that many will pay attention to is between Beanpot rivals Boston College and Harvard in the Northeast regional in Worcester, Mass. The Eagles edged the Crimson 3-2 in that tournament’s semifinal en route to claiming this year’s Beanpot. Both teams have high-powered offenses, and know each other well. The game also features NHL Draft picks like Harvard’s Jimmy Vesey (Nashville, 2012), Alexander Kerfoot (New Jersey, 2012), Merrick Madsen (Philadelphia, 2013) and Boston College’s Thatcher Demko (Vancouver, 2014), Jeremy Bracco (Toronto, 2015) and Colin White (Ottawa, 2015). There will be a rematch of the epic 2013 Frozen Four semifinal between Yale and Massachusetts-Lowell in the East regional first round at Albany, N.Y. The semifinal went to overtime before the Bulldogs’ Andrew Miller tallied the game-winner. Yale eventually won the national title after topping in-state and ECAC rival Quinnipiac in the title game. Another round-one rivalry game to watch is between future Big Ten rivals Michigan and Notre Dame. The two schools know each other well in other sports, and there’s a lot of vitriol between the two fan bases. The second round could also net some big games between conference rivals (Providence-Boston College of Hockey East, Quinnipiac-Yale of the ECAC and St. Cloud-Denver of the NCHC). The intensity will go up with a trip to the Frozen Four on the line. College hockey is quickly gaining traction as a viable path to the pros. Major juniors and national development programs still yield a good share of NHLers, but the collegiate game is getting respect. There are many draft picks playing in this weekend’s games and they will give glimpses of what may come when playing for their parent club. Someone like Vesey was “pro ready” according to Predators general manager David Poile at the end of last season. 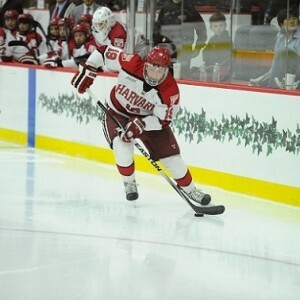 The Harvard scorer might get plugged into the lineup if he does sign his entry-level deal. RELATED: Should Jimmy Vesey Sign With the Predators, Will He Play Right Away? The NCAA basketball tournament has been known for the lower seed winning games they weren’t supposed to, but hockey has had a few of its own magical runs. Rochester Institute of Technology (RIT) in 2010 was only five years removed from moving up from Division III to Division I. The Tigers stunned many by making the Frozen Four that year after beating Denver (2-1) and New Hampshire (6-2). RIT would get blown out by Wisconsin in the national semifinal, but it was a great march to the semis and it could happen again with any one of the four seeds. This year’s tournament brings together some of the best coaches in the game. Jerry York of Boston College has over 1,000 wins and is the only Division I bench boss to reach that milestone. Michigan’s Red Berenson is in his 32nd and what could be last season leading the Wolverines. There are also coaches like Rand Pecknold (Quinnipiac), Bob Motzko (St. Cloud State), Norm Bazin (UMass-Lowell) and Keith Allain (Yale) have done a great job building up programs. These coaches may someday occupy the same company as York or Berenson. Much like the men’s basketball tournament, picking a winner will be hard. The top-seeds (Quinnipiac, North Dakota, St. Cloud State and defending national champion Providence) are all good, but face tough draws. Boston College, Michigan, Denver and UMass-Lowell are two seeds that have all played well this season. Boston University wants to get back to the title game and Yale is three years removed from winning the title and are sore after getting dumped in the ECAC quarterfinals by Dartmouth. This year’s tournament will be unpredictable and as many as five teams that could walk away with the national title. The event will be one of the most exciting in recent years. All of the reasons above will give drama and an event even casual hockey fans should check out.